Happy St. Patrick’s Day! I probably should have thought to post something festive before today, but instead it’s coming to you in a day or two. It’s a very tasty cabbage and pasta recipe, which I hope you’ll like. I wrapped up another community rotation of my internship this past week. This rotation included a lot of group education and a little bit of counseling. In both contexts, I was touched, as I always am, to be reminded of how deeply people care about nutrition and what they eat. It’s funny: in my nutrition grad program, we received so much guidance on motivating people and helping them to overcome their ambivalence. Motivational interviewing is virtually the only counseling technique we were taught, which I thought was a disservice. I understand why this was the way it was: our program was geared toward group education, rather than individual counseling, and one of the assumptions made was that we’d be working with groups of people who weren’t entirely sold on getting nutrition guidance in the first place–for example, those who have been referred to a dietitian by a primary care provider. The relentless focus on motivation and “rolling with resistance” always struck me as limited, because my overwhelming experience has been that people are interested in food and strongly motivated to eat better. For a while I wondered if my experience was intrinsically limited by the population of folks I’ve crossed paths with as a nutritionist, but now that I’m more than halfway into my internship, I’ve only seen more proof of how much people care and how motivated they are. From what I can tell, what stands in the way of meaningful change isn’t resistance or ambivalence so much as circumstance. It’s hard—really hard—to change one’s eating habits even when circumstances are working in one’s favor. It’s even harder in the face of life’s many difficulties, including financial hardship, stress, mental illness, family obligations, time constraints, and so on. Even with strong motivation in place, life can and does get in the way. This isn’t to say that incredible dietary transformations aren’t possible even when circumstance is stacked up against it, nor to suggest that all nutrition patients and clients are strongly motivated. I guess I’m just struck by often people’s desire for change shines through to me. I’ve seen so many examples in the last week alone, from the patient who broke into tears as she told me about a recent osteoporosis diagnosis (and her confusion about what to eat for bone health) to the patient in her early 90s who explained to me with pride his efforts to cook more vegetarian meals. None of my patients this year have lacked barriers to healthful eating. In spite of that, they care, and they’re doing their best. This all makes me think about an article I read a few weeks ago, which makes important points about the way we construct and label laziness. I’m linking to it in my reads today. It also reminds me to be compassionate to myself when things stand in the way of what I’d like to do. My mind’s refrain is always “I could have done more,” but it’s often the case that I actually couldn’t have, because circumstances (fatigue, scarcity of time, being distracted by something more urgent) stood in the way. I wanted to do more, which is fine to acknowledge, but it’s different. Wishing you a peaceful Sunday, with full recognition that you’re doing your best. We all are. Here are some recipes and reads. Lauren’s split pea soup with cheesy sage dumplings is the definition of comfort food! I can’t get over how authentic Anastasia’s vegan tofu benedict looks. I love the texture and color contrast of Stephanie’s smashed chimichurri potatoes. A perfect weeknight supper recipe for creamy, peanutty noodles and mushrooms. Finally, how adorable are these bunny-shaped vegan Easter rolls?! 1. Recent research has called into question the idea that eggs raise blood cholesterol, but a new study affirms the case for dietary moderation. 2. I love variety, but I also know the pleasures of a tried-and-true meal. I smiled to read this article on people who eat the same thing every day. 3. Edith Zimmerman grapples with the awareness that happiness is fleeting. 4. This article about California’s wild flower superbloom brought a smile to my face. 5. Finally, Devon Price on why laziness doesn’t exist. Much love to you this evening, friends. A veggie-packed pasta recipe is coming your way in a day or two. 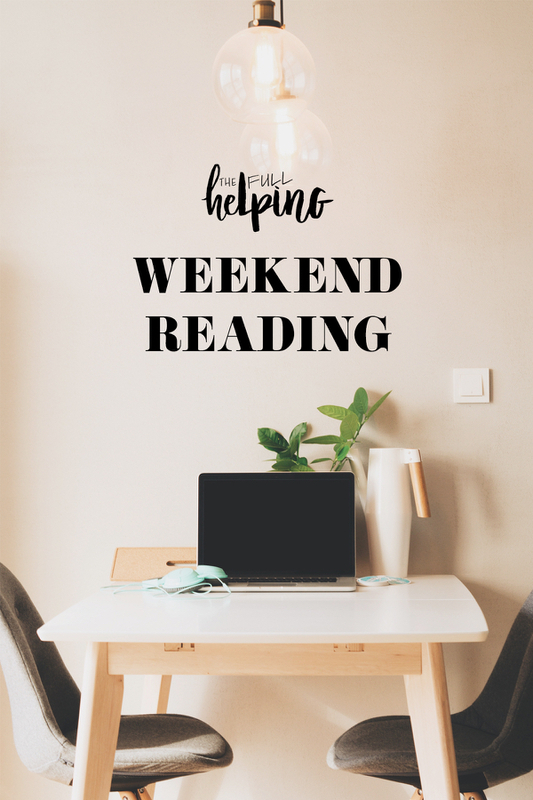 The post Weekend Reading, 3.17.19 appeared first on The Full Helping.